Pets are family here at Puff & Fluff and each member of our team takes great pride in the care they provide for our clients. Our core values include patience, teamwork, customer service, integrity, and, of course, a love for animals. With four locations in Arizona, we serve the local community with kindness and compassion. 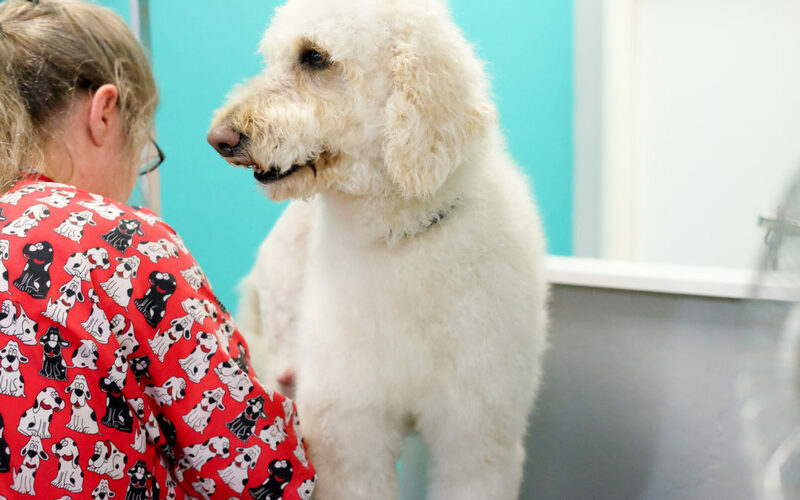 While there are plenty of grooming and pet sitting services peppered throughout the state, we encourage you to join our community of Puff & Fluffers! Of course, you’re paw-bably wondering what makes us different…keep on reading to learn more! With nearly 2,000 Instagram followers and over 2,100 fans on Facebook, Puff & Fluff is so much more than another grooming shop. Liz Illg is the Owner and CEO and she has made sure to infuse this business with her passion to build relationships with people (and pets, of course!) and within her local community. How does she do that? Liz loves to host events and raffles at our Puff & Fluff locations to benefit local pet rescues by partnering with other pet businesses in the community. Liz has also been featured on several local media outlets to share her love and knowledge about caring for pets. It’s easy to see how, with someone so passionate about pet care at the helm of this business, that energy trickles down to every other employee and customer who walks in the door. At Puff & Fluff, pet health and safety is our number one concern. We keep an open and honest relationship with all pet parents, and our team members are always available to answer any and all of your questions! Plus, we offer both dog and cat grooming services at Puff & Fluff. These services include baths using hypo shampoo, blueberry facials, massage, blow dry, nails, glands, ear cleaning and plucking, full haircuts, and more! We can also jazz up your furry friend’s look with pet-safe dyes and nail colors! Did you know we also offer pet sitting services? That’s right! From hourly pet sitting to overnight care, we make sure your fur-children are kept safe, healthy, and happy while you’re away. You can learn more about all of our services here. Of course, if you have any questions, be sure to give us a call or stop by any one of our four locations. We have shops in Arcadia, Arrowhead, Litchfield, North 32nd, and Uptown for your convenience! When it comes to providing excellent care and customer service, we are an industry leader. Our clients always come first. Let us earn your business. If you aren’t satisfied, we will make it right. It’s that simple. That’s the Puff & Fluff difference.